Recently I came across the ‘Magic Sponge’ which can lift dry watercolour paint from paper and was super curious about it, I mean who wouldn’t be with a name like ‘Magic Sponge’? So today I have a new video with a product test for the Magic Sponge. If you haven’t come across this product yet it is actually melamine foam which has really strong abrasive properties, i.e. it scrubs well! The structure of the foam is such that it acts like a super fine sandpaper. The funny thing is is that you may already have some in your home as it has been marketed as a cleaning product under various names for many years. I don’t know exactly when they started marketing it to artists as a watercolour eraser but I think it has been on the art product market for a good decade but you can correct me if I am wrong! For my test I have compared how it works with watercolour paints, Distress Crayons, Slick Stix, Distress Stain, Distress Ink and tried it out on hot and cold press watercolour paper as well as an ordinary cardstock. So sit back and enjoy the film! 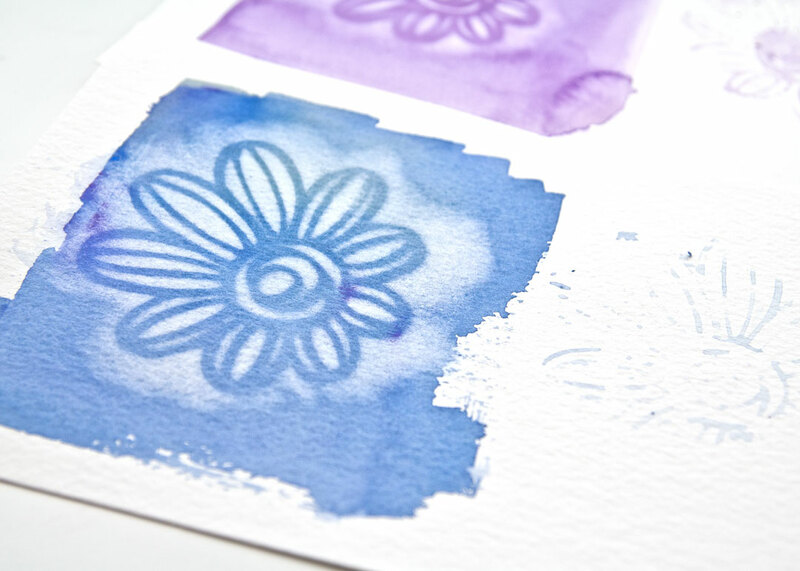 Oh and keep an eye out for a sneak peek at one of my new stencil designs for PaperArtsy (SPOILER ALERT: it’s pictured above if you missed it!). 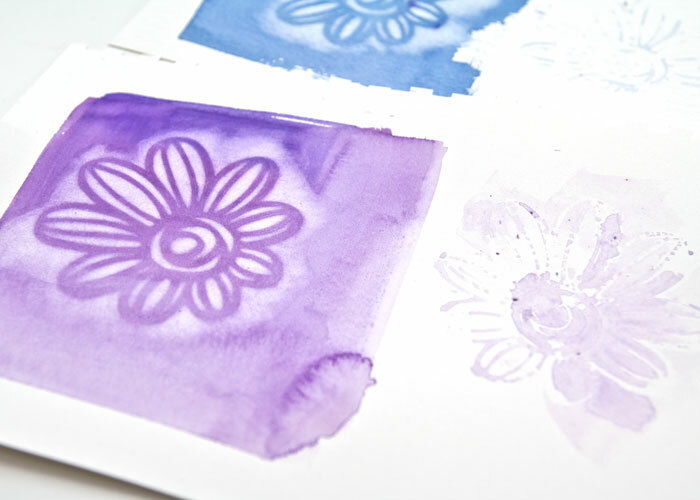 Above is a close-up of the results on the different papers and colouring products. As I said is it an abrasive and I did use it on my stencil with no apparent ill effect. All though I personally don’t think I would want to use it over and over again on the same stencil. I think it is cool for the occasional use to get specific effects, but I will leave you to make your own mind up about how you would like to use it! And so that you can see the stencil again (*WINK*) here is a close-up of the results of the lifting of the watercolour paint through the stencil on the cold press watercolour paper. Hope that the video was useful, I do plan to do more product testing from time to time so let me know if you have an art or craft product you would like to see in action and if I have it I will do my best to test it and video the results! 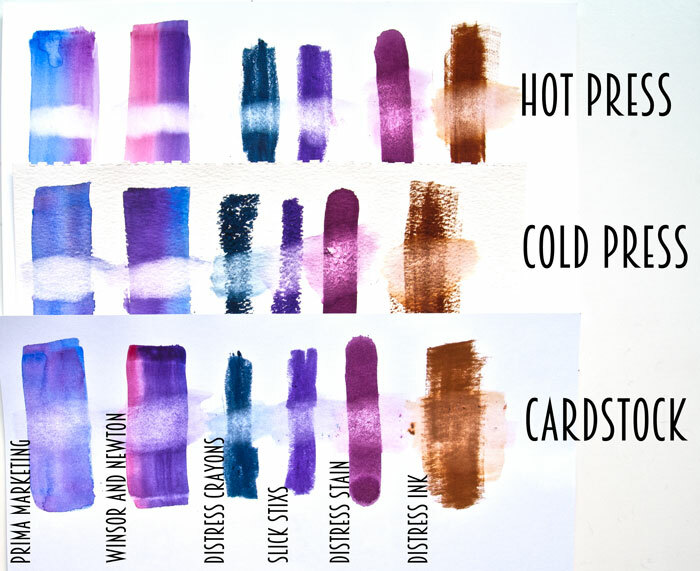 Meanwhile, don’t forget to watch my last product test video which was the Tim Holtz Distress Crayons Versus Crayola Slick Stix face-off!